So many have had neck problems, some more sever than others. Treat Your Own Neck seems to have a cure for those problems where doctors have no sure except drug. Help yourself to a pain-free neck. The simple and effective self-help exercises in Robin McKenzie's Treat Your Own Neck have helped thousands find relief from common neck pain. This easy-to-follow book helps you understand the causes, treatments and exercises to help relieve pain and prevent recurrence. Many times rest, the right exercise and knowledge seem to be the right answer. New Breeders is a location based web service for the action sports community that makes your search for spots easier. Through the web and your mobile phone, New Breeders offers a personalized overview of locations relevant to you. Create your own profile, add your favorite locations and manage all your favorite spots, shops, events, bars and more. See your friends’ favorite locations and add them to your personal checklist. Browse spots all around the world, see what is going on and plan your next trip. New Breeders gives you get the best possible advice where you need it, when you need it. Barbells That Click Into Place. 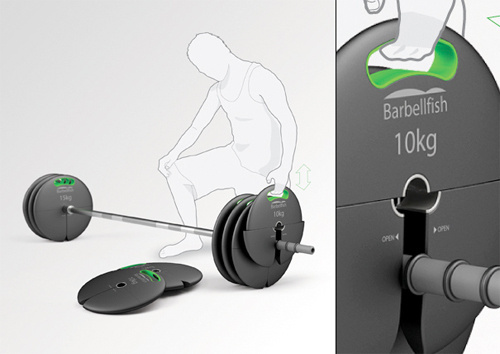 Great redesign for weights, why slide them on when you can click it.